Look in the June 2008 issue of Wired Magazine (p. 52) to see Lostpedia topping the half tongue-in-cheek list of Wired's 8 best non-Wikipedia Pedias. Yup, the W8BNWPP, an honor indeed. 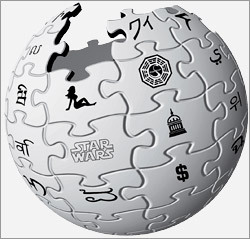 At least we beat "Dickipedia" and more importantly "Wookieepedia": "Did you know that "snot vampire" is slang terminology for the Anzati species? Of course not. No one did." Oh and did I mention who came in 8th? You'll have to click over to Wired's online edition here to see. And I thought we were all "wikis", not "pedias". Then the 8th place wouldn't even qualify for the list because it's a pedia, but definitely not a wiki. There you go. In any case we topped them all. Or was it the other way around? The list wasn't numbered. Oh well, so we're not Mom's cure for diarrhea, but we're in good company anyway and we're honored: Thanks, Wired!